Happy Wednesday y’all! I slept in this morning, so I didn’t have breakfast. 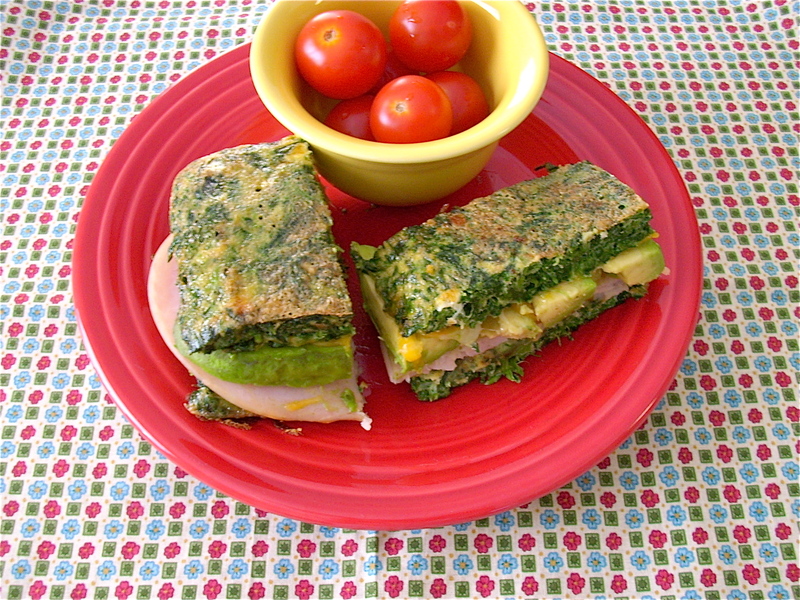 For lunch, my meal plan called for sandwiches made using Suzanne Somers’ spinach bread. I was pretty excited to try this recipe out. 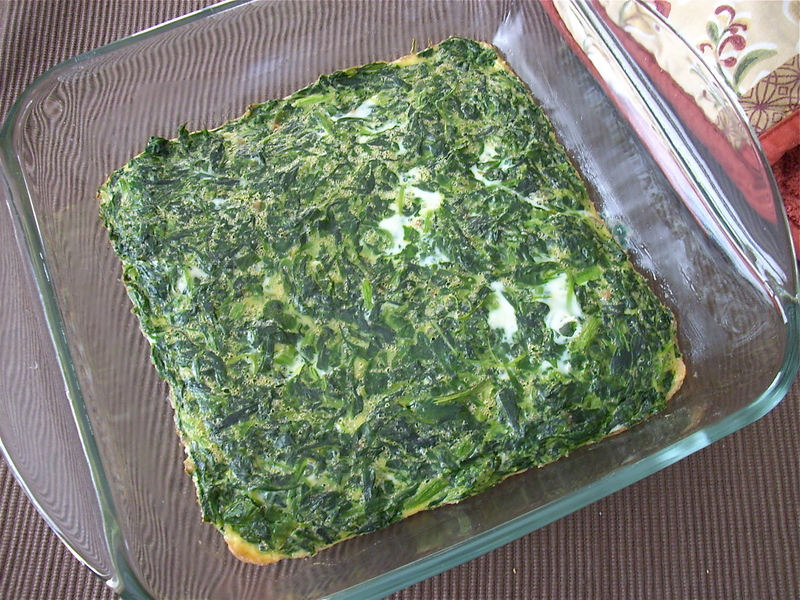 In her Fast & Easy Cookbook, she said that the spinach “bread” was a “must try” recipe, and that she considered it to be one of the cornerstone recipes of the book. I’ve had her book for awhile, and have been wanting to give it a try ever since I first read that. This spinach “bread” is super, super simple to make. It can even be made ahead and refrigerated or frozen until your ready to use it. All you have to do is mix together 4 large beaten eggs, 1 (10oz) pkg. of frozen, chopped, defrosted and drained spinach, 1/4 tsp crushed garlic ( I used garlic powder) and some salt & pepper. Pour that into an 8×8 glass baking dish that has been greased with butter, then place into a pre-heated 400° oven and bake for 15 minutes or until set. *Just a quick note: if you decide to make this, be sure to get all of the liquid out of the spinach. I put my spinach into a coffee filter and squeezed it really hard, but some people use a dish towel. I’ve really missed sandwiches ever since we started cutting back on grains and simple carbs, and one of the reasons I wanted to make this bread was because of this other recipe in her book. 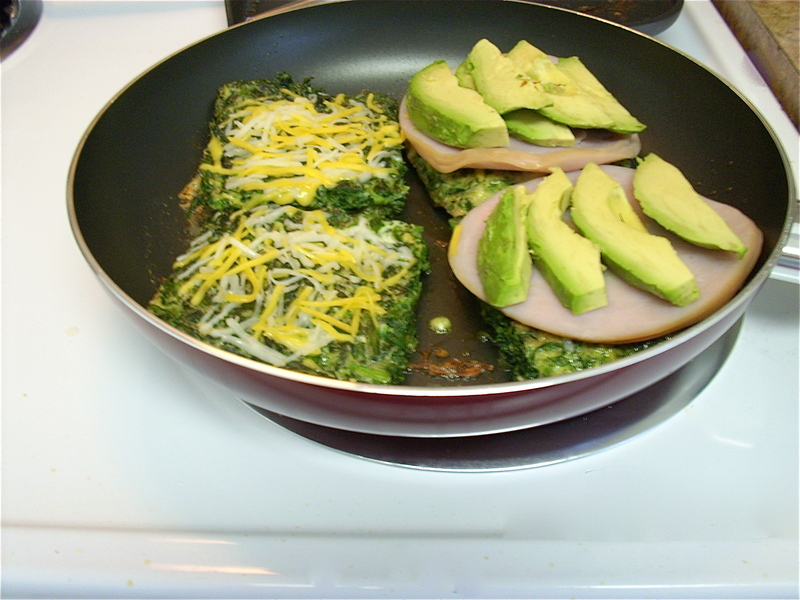 It was a recipe for Green Eggs and Ham Sandwiches using the spinach “bread”. Her recipe called for bacon and swiss cheese, but I didn’t have either one of those, so I improvised. For my sandwiches, I let the bread cool slightly, then I cut it into four even slices. I heated a skillet over medium heat, then added about a tablespoon of butter to the pan. I added the slices of bread to the pan, and cooked them until the bottoms were lightly browned, then I flipped them and added some cheese ( I didn’t have sliced cheese, so I used shredded Mexican cheese) to each piece. To two of the slices, I put three slices of nitrate-free smoked turkey meat and some sliced avocado, then topped it with the other slices of bread. I cooked it for a couple of minutes more to finish melting the cheese. I cut the sandwiches in half and had some cherry tomatoes on the side. Have you ever made any kind of “bread” without using flour? By Tempie at July 11, 2012 .